"Yeah, I played a Gibson L1 [on The White Stripes’ album Icky Thump]. That’s the Robert Johnson model. I have one from 1915. There are clips of me using that one all over the place on the last tour. We just put a surface-mounted pickup on it, one of those you tape on, like they use on a violin. It was hard to pull off live. But we do have songs where Meg wouldn’t play so loud and it would be okay. I love that guitar a lot. It’s probably my favorite." Jake Bugg can be seen using a Gibson Robert Johnson L-1 in this picture. 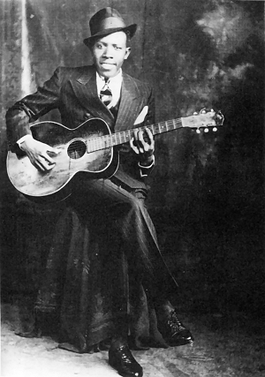 No reviews or videos yet for Gibson Robert Johnson L-1. With an Equipboard account you can rate this item, add it to your collection, submit a review to discuss what you like and dislike about it, and associate Gibson Robert Johnson L-1 to artists that use it. Create an account!